Not exactly Canadian, but I felt that I would take advantage of editorial license as the company doesn’t state exactly where the survey respondents were from – if they were all living in the USA or not. Over the past few years, the popularity of mobile phones and tablets have contributed to an explosion in gaming by offering users the newfound ability to game anytime and anywhere. A study  just released by the research consultancy, Latitude , offers a deeper-dive investigation into the new gaming landscape and the profile of tomorrow’s gamer, suggesting opportunities for both game developers and companies across industries. 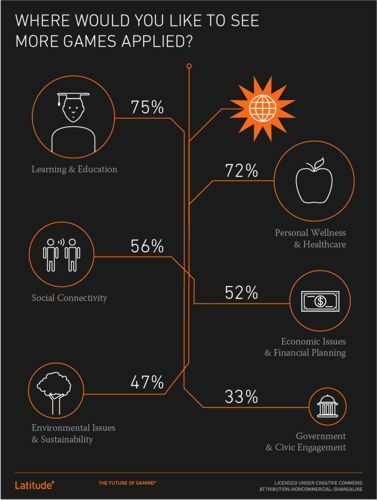 A complete study summary  (PDF) is available for download from Latitude. The study included a Web survey of 290 smartphone owners between the ages of 15-54 who self-identified as “casual gamers,” with nearly half labeling themselves “game enthusiasts.” More than two-thirds said they expect to be gaming even more over the next few years. The multi-phase The Future of Gaming: a Portrait of the New Gamers study was designed by Latitude to investigate the evolution of gaming, to profile tomorrow’s gamers, and to showcase resulting opportunities across industries for the future of gaming. Smartphone ownership was a criterion for survey participation, but engagement with mobile games was not. The study found that the stereotype of the reclusive gamer is outdated; this emerging demographic is social, heavily engaged with the “offline” world, and extremely goal-oriented – with a strong drive to improve themselves and the world around them. The new gamers are not constrained to any single platform, and have many different motivations for gaming in addition to just having fun [See New Gamers – Infographic- right]. Moreover, they expect that online games will continue to move out of the traditional screen environment, blending seamlessly with the “offline” world in new and engaging ways that go beyond just “checking in” with apps like Foursquare and SCVNGR. Eager to get beyond their smartphone screens, gamers are actively seeking new levels of interactivity, more intuitive interfaces (e.g., gestural or telepathic controls), and personalization of the physical world that mirrors what’s possible online. Future games should register and respond to people as they exist in the offline world, which may mean using a player’s location, mood or stress level as metrics in a game, or allowing players to overlay virtual environments or information onto their actual surroundings, as with augmented reality [See ‘New Gamers – Chart 5 – right]. 95 percent would like to see more games that do a better job of combining digital content with the real, physical world. 90 percent agreed that current and future technologies will play a critical role in extending games beyond the traditional screen environment, moving them out into the real world. 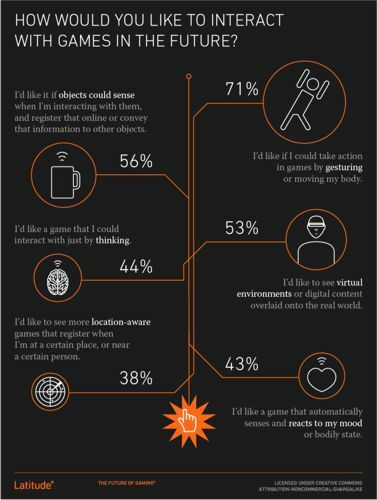 Not only did participants want games to be well-integrated with the offline world in a technological sense, they requested games that better fit into the context of everyday life activities, and could provide added incentive to do things they want or need to do anyways. Currently, a variety of “life games” exist for personal wellness, learning, and even for completing household chores. More than two-thirds would like games to help them achieve their personal goals, such as being healthier or more productive. The social aspect of gaming makes it particularly well suited to tackling larger societal issues, as people can now share meaningful experiences easily in real-time. Obstacles related to engagement, crowdsourcing, and logistics are removed as mobile platforms make it easier to become an engaged community member or to get involved with socially good causes in a way that feels game-like, either overtly or in a broader, “social adventure” sense. 3 in 4 people would be more interested in getting to know their neighbors and the people in their communities if local meet-ups were designed to be more game-like (e.g., involving neighborhood “teams,” scavenger hunts, etc.). In conjunction with The Future of Gaming survey, Latitude conducted a series of expert interviews with both game makers and game enthusiasts, culminating in the production of a mini-documentary, The Future of Gaming: a Portrait of the New Gamers, produced in collaboration with In the Car Media. This thought-provoking snapshot of the new gaming landscape serves up fresh, insider perspectives on how games have evolved, and who exactly is playing today – or will be tomorrow. The full video, featuring Buster Benson, CEO of Health Month , is available in HD on Vimeo .